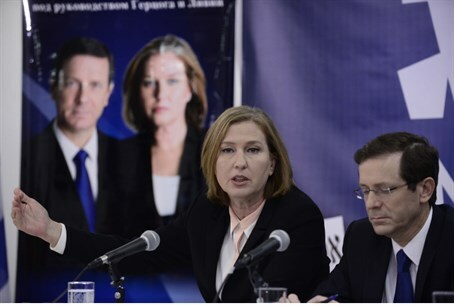 Zionist Camp Chairpersons Yitzhak Herzog and Tzipi Livni toured the northern border Monday, making it a point to continue their attacks on Prime Minister Binyamin Netanyahu. "Bibi's failure against Hamas in the Gaza envelope severely impairs our deterrence against Hezbollah on the northern border," Herzog charged. "Bibi failed in security, just as he failed in housing, the cost of living, and reducing social inequalities," the Labor leader continued. "Netanyahu is running away from responsibility - we take responsibility - and your security is our responsibility." Livni added that "Israel's security and our power to deter attacks is based on a strong army and our relationship with the United States, that the same Netanyahu would tear to pieces." "I took part in the decision-making process for three wars and dozens of operations. I saw up close how important the international community is to give the IDF the scope to win," she added. The Zionist Camp's choice for Defense Minister, Amos Yadlin, made similar comments recently, noting that Iran and Hezbollah saw Israel's hesitancy during Operation Protective Edge and decided to strike. "Countries in the region saw that Hamas was not hit strongly enough, how Israel granted immunity to its leadership instead of hurting it, and how the government conducted negotiations for a ceasefire. This is a violation of Israel's deterrence and we need to restore it," the former IDF General said. Bringing the discussion Monday to the future elections, Livni stressed that if Netanyahu is elected prime minister again, "he will send IDF soldiers to fight battles with their hands tied behind their backs - without legitimacy to fight, without freedom of movement, and with legal threats from the International Criminal Court at the Hague." "This will significantly hurt our ability to win a war militarily and politically," she added. Livni then addressed financial matters, forcefully stating that Labor-Hatnua "will also change Israel's priorities. All the money thrown down the drain to settlements, we will transfer to the periphery and the confrontation lines."